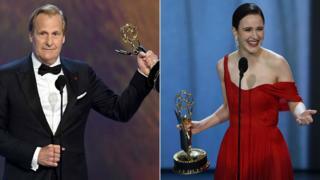 The 70th annual Primetime Emmy Awards have taken place in Los Angeles. It was a big night for British talent - with Thandie Newton, Claire Foy, Charlie Brooker, Matthew Rhys and John Oliver among the winners. Here's the full list of winners from Monday's ceremony (the less high-profile awards were handed out last week at the Creative Arts Emmys).